This study investigates the relationship between economic growth, energy consumption, trade openness, population density, and carbon dioxide (CO2) emissions in Bangladesh for the period of 1975 to 2013. It applies the Autoregressive Distributed Lag (ARDL) bounds testing approach to cointegration for establishing the existence of a long-run relationship. The bounds tests suggest that the variables of interest are bound together in the long-run when CO2 emissions is the dependent variable. The results indicate that energy consumption has statistically significant positive effect on CO2 emissions both in the short-run and long-run. The effect of population density is significant in long-run, but not in short-run. The estimated coefficients for economic growth and trade liberalization are negative and insignificant both in short-run and long-run. The paper suggests that the government of Bangladesh should undertake the policy actions to develop alternative energy sources which would not emit much CO2. After independence in 1971, Bangladesh pursued the import-substitution industrialization strategy. It was the regime of highly restricted trade and exchange rate policy characterized by high tariffs and non-tariff barriers to trade. Since the restricted trade policy didn’t realize the expected outcome, the country implemented the large-scale liberalization of trade in the early 1990s. Trade liberalization played a vital role in developing the country’s economy. Over the last decades since 1994, Bangladesh’s economy has been growing steadily at the rate of higher than 5%. While this growth has brought many socioeconomic benefits, its impact on environmental degradation has been at the centre of growing debate in the recent years. As energy is an essential resource for modern life and vital factor of economic development, an increase in energy consumption boosts economic growth. The recent growth of Bangladesh is largely dependent on energy consumption. As sources of energy consumption, Bangladesh mostly consumes fossil fuels (natural gas, oil, coal, etc.) which contain high percentages of carbon. Furthermore, Bangladesh is one of the heavily densely populated countries of the world. The population density in 2015 was 1,236.81 persons per square kilometre. High density of population can have impact on environmental degradation through CO2 emissions. In this situation, it is interesting to know the relationship between economic growth, energy consumption, trade openness, population density, and carbon dioxide (CO2) emissions. Fig. 1 exhibits the trend in each series in logarithmic form over the period 1975-2013 for ready reference. A glance at Fig. 1 makes it clear that CO2 emissions per capita (ln CO), real GDP per capita (ln Y), energy consumption per capita (ln E), and population density (ln P) in Bangladesh have been witnessed a steady upward trend during 1975-2013. However, trade openness (ln O) witnessed downward trend from 1980 till 1992 due to the import-substitution industrialization strategy which was characterized as highly restricted trade regime. Trends in economic growth, energy consumption, trade openness, population density, and CO2 emissions. Empirical studies to find the relationship between energy consumption and economic growth have been undertaken for different economic regions and countries (Ozturk and Acaravci, 2010; Apergis and Payne, 2009). In addition, other numerous studies have examined the relationship among CO2 emission, energy consumption, and economic growth (Hossain and Syed, 2016; Islam et al., 2012; Rahman, 2011; Zaman, 2011). Naranpanawa (2011) has analysed the link between trade openness and carbon emissions in the case of Sri Lanka during the period of 1960-2006. The results found no long run, but short-run equilibrium relationship between trade openness and carbon emissions for Sri Lanka. However, Chebbi et al. (2009) found different result with the same variable. The study reveals that the direct effect of trade openness on CO2 emissions is positive both in the short and the long run, but the indirect effect is negative at least in the long run. Dogan and Turkekul (2016) explored that energy consumption and urbanization increase environmental degradation while financial development has no effect on it, and trade leads to environmental improvements in the long run. Long et al. (2015) found the dominant positive impact of coal, gas, and electricity consumption on CO2 emissions. Ohlan (2015) attempted to find out the effects of population density, energy consumption, economic growth and trade openness on CO2 emissions in India. Using annual data for the period 1970-2013, the study found that population density, energy consumption and economic growth have statistically significant positive effect on CO2 emissions both in the short-run and long-run. Mahmood and Chaudhary (2012) revealed that FDI, value-added manufacturing industry, and population intensity increase CO2. The study found the long run relationship in the model but short run relationship did not exist. Shahbaz et al. (2013) validated the presence of cointegration between CO2 emissions, financial development, energy consumption, and economic growth for the case of Malaysia. Zhou and Liu (2016) assessed the impact of demographic and income changes on China’s energy-related CO2 emissions at the national and regional levels using balanced provincial panel data from the 1990-2012 period. The study showed that income rather than demographic change has been the dominant driving force behind China’s growing CO2 emissions. Furthermore, some researchers have dealt with multi-country and panel data investigations (Akin, 2014; Sebri and Ben-Salha, 2014; McAusland and Millimet, 2013; Narayan and Narayan, 2010; Lee et al., 2009). Asongu et al. (2016) observed data of 24 African countries and explored that there appears to be a long-run relationship between energy consumption, CO2 emissions, and GDP. Akhmat et al. (2014) examined the causal relationship between energy consumption and environmental pollutants and found out that an increase in energy consumption leads to an increase in environmental pollutants in selected South Asian Association for Regional Cooperation (SAARC) countries. Ozturk (2010) investigate the causal links between CO2 emissions, energy consumption, and economic growth in nineteen European countries. The bounds F-test for cointegration test show that there exists a long run relationship between the variables. Using panel FMOLS method, Saboori and Sulaiman (2013) analyses the relationship between economic growth, energy consumption and CO2 emissions in selected Association of Southeast Asian Nations (ASEAN countries) from 1971 to 2009. ARDL bounds test results reveal the presence of a cointegration relationship between the variables and there exists a positive relationship between CO2 emissions and energy consumption in both the long and short-run. Managi et al. (2009) found a mixed result that trade is found to benefit the environment in OECD countries, but it has detrimental effects in non-OECD countries. However, this paper is different from the existing literature in the following sense. First, most of the previous studies have not taken into account the population density in Bangladesh context while population growth and its density are responsible for environmental degradation. As population rises, the demand for energy and fuel, demand for industrial good and transportation would also rise (Mahmood and Chaudhary, 2012). Bangladesh is one of the most populous country in the world and placed in the list of top ten countries by population density. This paper, hence, after observing the findings of relevant literature introduced above, aims at filling the gap in related literature to some extent by focusing on comparing the relationships between economic growth, trade openness, population density, and carbon dioxide (CO2) emissions in the case of Bangladesh. Second, although the previous literature has covered similar variables, there are very few studies done covering the data of Bangladesh. More importantly, Bangladesh has got very limited attention from researchers analysing similar variables using the Autoregressive Distributed Lag (ARDL) model. This research adds value into the current literature by incorporating population density along with other variables in the ARDL model to find its impact on CO2 emissions, especially in the case of Bangladesh. The study takes carbon dioxide emissions as dependent variable and economic growth, energy consumption, trade openness, and population density as independent variables. The time period used for the estimation is from 1975 to 2013 on yearly basis. The secondary data used in this paper have been obtained from World Development Indicators (http://data.worldbank.org). In the paper, the general functional form of the model for estimating the influence of economic growth, energy consumption, trade openness, population density, and CO2 emissions is developed as equation (1). where CO2 is the carbon dioxide emission, Y is real GDP per capita as a proxy of economic growth, E is energy consumption, O is trade openness, and P is population density. CO2 emissions, measured in metric tons, were transformed into a per capita measure to adjust for the population size of the country. Economic growth is measured as real GDP per capita. Trade as share of GDP is the proxy for trade openness (trade liberalization). Population density is expressed in people per square kilometre. Energy consumption is measured in kilograms of oil equivalent per capita. The Autoregressive Distributed Lag (ARDL) bounds testing approach has been employed in this paper to examine the impact of economic growth, energy consumption, trade liberalization, and population density on CO2 emissions in Bangladesh. The ARDL modeling approach was originally introduced by Pesaran and Shin (1999) and further extended by Pesaran, Shin and Smith (2001). Compared with other cointegration methods such as the two-step approach by Engle and Granger (1987) and the Johansen test (1988), the ARDL bounds testing approach for cointegration enjoys certain econometric advantages. This approach is based on the estimation of an Unrestricted Error Correction Mechanism (UECM) which has several advantages over the conventional type of cointegration techniques. The first one is that the ARDL does not need that all the variables under study must be integrated of the same order and it can be applied when the under-lying variables are integrated of order one, order zero or fractionally integrated. The second advantage is that the ARDL test is relatively more efficient in the case of small and finite sample data sizes. The third advantage is that by applying the ARDL technique we obtain unbiased estimates of the long-run model (Harris and Sollis, 2003). Fourth, once the orders of the lags in the ARDL model have been appropriately selected, we can estimate the cointegration relationship using a simple Ordinary Least Square (OLS) method. The limitation of the ARDL bounds testing is that this approach is unable to provide any empirical results in the presence of I(2) series (Ohlan, 2015). where Δ is the operator of first-difference, ln represents natural logarithm transformation, b0 is an intercept, t represents time, b1, b2, b3, b4, b5 represent the short-run dynamic relationship and b6, b7, b8, b9, b10 denote the long-run dynamic relationship, while ε is a white noise error term, assumed to satisfy all the basic assumptions of the classical linear regression model. In the ARDL model, the bounds test is adopted to determine whether there is a long-run equilibrium between the variables, namely whether the cointegration relationship exists. The bounds test is mainly based on the joint F-statistic whose asymptotic distribution is non-standard under the null hypothesis of no cointegration. The first step in the ARDL bounds testing approach is to estimation of Equation (1) by ordinary least squares in order to test for existence of a long-run relationship among the variables by conducting an F-test for the joint significance of the coefficients of the lagged level variables, i.e., H0: b6=b7=b8=b9=b10=0 (No cointegration) against the alternative H1: not H0 (Cointegration exists). Two sets of critical value bounds for the F-statistic are generated by Pesaran et al. (2001). If the computed F-statistic falls below the lower bound critical value, the null hypothesis of no-cointegration cannot be rejected. Contrarily, if the computed F-statistic lies above the upper bound critical value; the null hypothesis is rejected, implying that there is a long-run cointegration relationship amongst the variables in the model. Nevertheless, if the calculated value falls within the bounds, inference is inconclusive. The orders of the ARDL (p, q1, q2, q3, q4) model in the five variables are selected by using Schwarz Bayesian Criterion (SBC). For subsequent use in the error-correction model, the error correction term (ECMt-1) is obtained from the estimation of the equation (3) and we use the residuals. where b1i, b2i, b3i, b4i and b5i are the short-run coefficients, and λ is the speed of adjustment parameter since ECMt-1 is the error correction term. If λ is negative, that means that there is correction mechanism for the gap between the variables. Before proceeding with the ARDL bounds test, test for the stationarity status of the selected time series data has been performed to determine their order of integration. This is to ensure that the variables should not be I(2) because the computed F-statistics provided by Pesaran, Shin and Smith (2001) are valid only when the variables are I(0) or I(1). For this purpose, the augmented Dicky-Fuller (ADF) and Phillips Perron (PP) unit root tests have been applied. The results of these tests reported in Table 1 show that CO2 emissions per capita (ln COt), real GDP per capita (ln Yt), energy consumption per capita (ln Et), and trade openness (ln Ot) series are I(1), whereas population density (ln Pt) series is I(0). Results of ADF and PP unit root tests. After testing the stationarity status of the selected time series data, Autoregressive Distributed Lag (ARDL) bounds testing approach has been employed. Table 2 presents the result of ARDL bounds test for the cointegration relationship based on equation (2). The appropriate lag length was selected on the basis of Schwarz Bayesian Criterion (SBC) for the conditional ARDL. The Table result reveals that the calculated F statistic is obviously greater than be the upper bounds critical values when CO2 emissions (ln COt) and population density (ln Pt) were used as dependent variables. Accordingly, the null hypothesis of no cointegration is rejected. It entails that a long-run relationship exists between the variables in the case of Bangladesh over the period from 1975 to 2013. ARDL bounds tests for cointegration. Once the existence of cointegration relationship among the variables is confirmed, the long-run impacts of these variables on CO2 emissions have been estimated. According to Equation (3) and the principle of minimum SBC value, we single out the ARDL (3, 0, 2, 3, 1) model, and the estimated results for the long-term relationship are shown in Table 3. 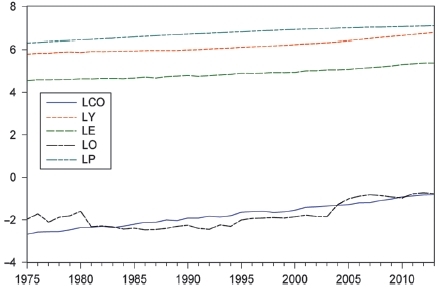 Estimated long-run coefficients from ARDL model. Next, in order to check the short-run relationship between the variables the ECM is employed. The results of short-run dynamics are reported in Table 4. The result reveals that the estimated lagged error term (ECMt-1) is statistically significant at the 5% level with a negative sign. This finding confirms the earlier long-run relationship between the series and shows the speed of adjustment from the short-run toward long-run equilibrium path. Error correction representation for the selected ARDL model (ARDL(3,0,2,3,1) selected based on Schwarz Bayesian Criterion). The stability of the long-run coefficient is tested by the short-run dynamics. 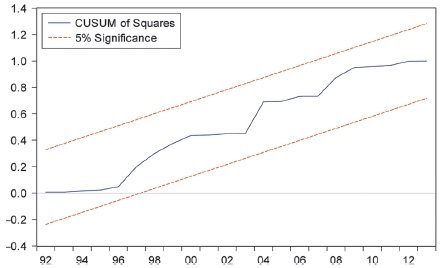 Once the ECM model given by equation (4) has been estimated, the cumulative sum of recursive residuals (CUSUM) and the CUSUM of square (CUSUMSQ) tests are applied to assess the parameter stability. Figs. 2 and 3 plot the results for CUSUM and CUSUMSQ tests. 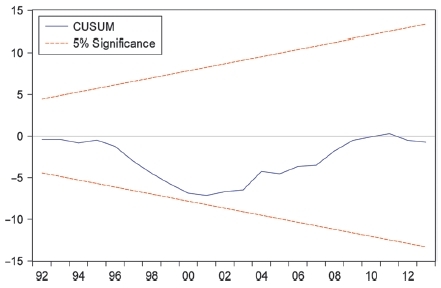 The results indicate the absence of any instability of the coefficients because the plots of the CUSUM and CUSUMSQ statistics fall inside the critical bounds of the 5% level of significance. Plot of cumulative sum of recursive residuals. Plot of cumulative sum of squares of recursive residuals. In this paper, annual time series data from 1975 to 2013 have been used to test the relationship between economic growth, energy consumption, trade openness, population density, and carbon dioxide (CO2) emissions in Bangladesh. The following conclusions are drawn: (1) all the series other than population density appear stationary in the first difference for the logarithmic form; (2) the bounds tests suggest that the variables of interest are bound together in the long-run when CO2 emissions is the dependent variable. The results also indicate that energy consumption has statistically significant positive effect on CO2 emissions both in the short-run and long-run. The effect of population density is significant in long-run, but not in short-run. Bangladesh is considered one of the world’s most energy-poor nations, with an immense gap between the power supply and demand, according to the World Bank collection of development indicators. While the country has one of the lowest per-capita electricity consumption rates, the demand for electricity is growing day by day with the development of the country. The government is also struggling to boost production. The paper suggests that the government of Bangladesh should undertake the policy actions to develop alternative energy sources which would not emit much CO2. Other environmental policies and regulations should also be undertaken to fight against the environmental degradation in the country. The estimated coefficients for economic growth and trade liberalization are negative and insignificant both in short-run and long-run. With the trade liberalization process, the most beneficiary sector of Bangladesh is the ready-made garments (RMG) industry. Bangladesh’s export trade is now heavily dominated by this industry which accounts for 81% of total export earnings of the country. In the functional upgrading stages of global RMG value chain, Bangladesh mostly engages in Cut, Make, and Trim (CMT) activities. More clearly, this industry imports raw materials, engages in CMT activities, and finally exports the finished goods. As the CMT activities are highly labour intensive, Bangladesh’s RMG sector still remains relatively clean and low emission industry. Thus, government attempt for export diversification should be directed to the clean industries which would not emit much CO2 emissions. Akin, C.S., (2014), The impact of foreign trade, energy consumption and income on CO2 emissions, International Journal of Energy Economics and Policy, 4(3), p465-475. Chebbi, H.E., Olarreaga, M., Zitouna, H., (2009), Trade openness and CO2 emissions in Tunisia, ERF 16th Annual Conference, November 7-9, 2009. Harris, R., Sollis, R., (2003), Applied Time Series Modelling and Forecasting, Wiley, West Sussex. Hossain, A.K.M.N., Hasanuzzaman, S., (2016), The Impact of Energy Consumption, Urbanization, Financial Development and Trade openness on the Environment in Bangladesh: An ARDL Bound Test Approach, Retrieved November, 2016, from http://bea-bd.org/site/images/pdf/28.pdf. Islam, M.R., Cheng, Y., Rajib, M.S.U., (2012), International trade and carbon emissions (CO2): The case of Bangladesh, Journal of Economics and Sustainable Development, 3(5), p18-26. Mahmood, H., Chaudhary, A.R., (2012), FDI, population density and carbon dioxide Emissions: A case study of Pakistan, Iranica Journal of Energy & Environment, 3(4), p355-361. Naranpanawa, A., (2011), Does trade openness promote carbon emissions? empirical evidence from Sri Lanka?, The Empirical Economics Letters, 10(10), p973-986. Pesaran, M.H., Shin, Y., (1999), An autoregressive distributed lag modelling approach to cointegration analysis, Econometrics and Economic Theory in the 20th Century: The Ragnar Frish Centennial Symposium, Cambridge University Press, Cambridge, p371-413. Rahman, M.Z., (2013), Relationship between trade openness and carbon emission: A case of Bangladesh, Journal of Empirical Economics, 1(4), p126-134. World Bank, (2010), World development indicators, World Bank, Washington, DC. Zaman, R.Z., (2011), CO2 Emissions, Trade Openness and GDP per capita: Literature Review and Empirical Study on the Case of Bangladesh (Master’s thesis, University of Bari, Italy), Retrieved November, 2016, from https://mpra.ub.uni-muenchen.de/48515/1/MPRA_paper_48515.pdf.